I don't get down to Edmonton often. In fact, it had been months. The last time I went, there was still a fair bit of construction and a few points with long stretches of single lane traffic. And while I knew that 99-percent of the highway had been twinned, it didn't really hit home until I drove it for myself. The first time I drove up to Fort McMurray was in 1996. 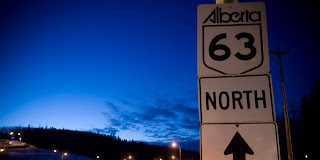 Highway 63 was a single lane highway - at the time, a rather benign stretch of pavement. However, as the economy picked up and went from simmer to a rolling boil, Highway 63 became known as the Highway of Death and various other monikers. The volume of traffic, the behaviour of the drivers, the wide loads, and the weather all combined to take too many lives. When a single collision took the lives of 7 beautiful people, the community rose up and said "enough is enough". The government responded and tasked then MLA Mike Allen with leading an effort to come up with a set of recommendations that would fast-track the completion of the twinning and provide some short-term strategies to improve the safety of the highway immediately. I was there when the announcement was made that the twinning would be complete by 2016. It was a cold fall day and a mix of media and government leaders gathered on a stretch of pavement to make the formal announcement. Now that the billion dollar project is complete, it is important to remember the effort that went into it. Hundreds, if not thousands, of men and women used their skills to shape the landscape, overcome technical challenges, and deliver a great product well ahead of schedule. I drove the speed limit the entire way home from Edmonton to Fort McMurray. Being able to drive 110 km/hr on the twinned highway cut the time of the trip and the stress normally associated with the drive. In fact, once I got on the twinned portion of Highway 63, I didn't have a single solitary moment of stress; it was one of the smoothest rides I have ever had. My thanks to everyone who had a hand in making the twinning of Highway 63 a reality. It is an asset for everyone in Wood Buffalo and in many ways, for the entire province. We are grateful.